Following publication of minutes of an emergency meeting of the HS2 Euston Strategic Board, it has been revealed that work on additional provisions which were due to be submitted to amend the current HS2 Hybrid Bill have paused, as the design being worked on for Euston station is ‘not a fundable solution’. Euston Development Director Rupert Walker told the meeting on 9th October that designs could not be made to work as there was no business case, and that to make the business case for the Euston station rebuild, more development would have to be included. It was also revealed that there were also unresolved issues concerning the operation of trains during construction. 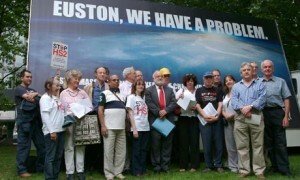 HS2 will require a complete rebuild of Euston, as every track and platform would have to be moved to accommodate HS2. When the HS2 Hybrid Bill was deposited, the originally proposed total rebuild had been scrapped, in favour of an extension of the station to be built on the western edge of Euston. However, it was then decided to go back to the rebuild solution, with over station development (OSD) being included in an attempt to make the project financially viable. The last cost estimate for the Euston rebuild was £7bn, with £5bn of it expected to come from the OSD. Whilst in terms of engaging the community of Camden, four and a half years after HS2 was first announced, there is currently a period of eight weeks ongoing in which NR/HS2 are speaking to stakeholders to “find out what sort of engagement they want”. Previously, the chair of the HS2 Hybrid Bill Committee Robert Syms MP had said that his committee, which is currently hearing petitions from those living close to the HS2 route, might ‘skip ahead’ to Camden, to try and get it done before the General Election in May. But as Walker stated “designs wouldn’t be looked at until next year”, that scenario is now impossible. Instead of the planned HS2-project why will they not do it with a Maglev solution instead? As the Maglev train allow sharp curves and inclination of ten percent the double track can follow and be colocated with existing high ways. The UK Ultraspeed proposed an 600 kilometre long double track from London to Birmingham via the Pennines to Manchester Leeds , Newcastle. Edinburgh and finally Glasgow. This will cost 25 Million Euro pro kilometre or about £16 bln for the complete track. You get a top speed of 311 mph which will be reach after a short disttance. A six-car trainset will reach 187 mph after 4.2 kilometrwe while a TGV or ICE need 30 kilomtre. HSR type ICE although the Maglev train operate in a speed of 311 mph while the ICE operate in 155.5 mph. The Euroepan HSR reducee its velocity as effect of heavely increasing maintenance costs and concentrate on higher acceleration. Maglev i quite more effective, lower total costs, higher availability and relayability than common train do have.